Only 12 cars took a part in the second testing day of the Formula E pre-season and Sebastien Buemi was once again the fastest. The Renault e.dams driver set a time of 1:31.05, which was slightly better than result he had achieved a day earlier. The championship runners-up from the inaugural season this time was faster than DS Virgin Racing‘s Sam Bird, while the third best lap time was achieved by ABT Schaeffler Audi Sport‘s Daniel Abt. 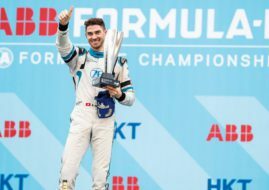 The young German had both cars at his disposal after he took over from birthday boy Lucas Di Grassi. “I am quite happy but we are really only at the start of the new package. Now we need to work on the details of the package. We could do quite a bit on the car and the car is a bit easier to drive, the stability is better, the brakes are better. I see some good potential, we just need to extract it from the car,” said Buemi at the end of the day. NEXTEV TCR and Trulli missed the second session of the pre-season due to technical difficulties, but both Mahindra Racing cars looked as strong as they did during the first day, so the Indian team was satisfied with its performance during the two-day tests. The FIA Formula E official pre-season testing resumes at Donington on Monday August 17.